I'm getting a kick out of completing these old sets I "started collecting" as a kid. 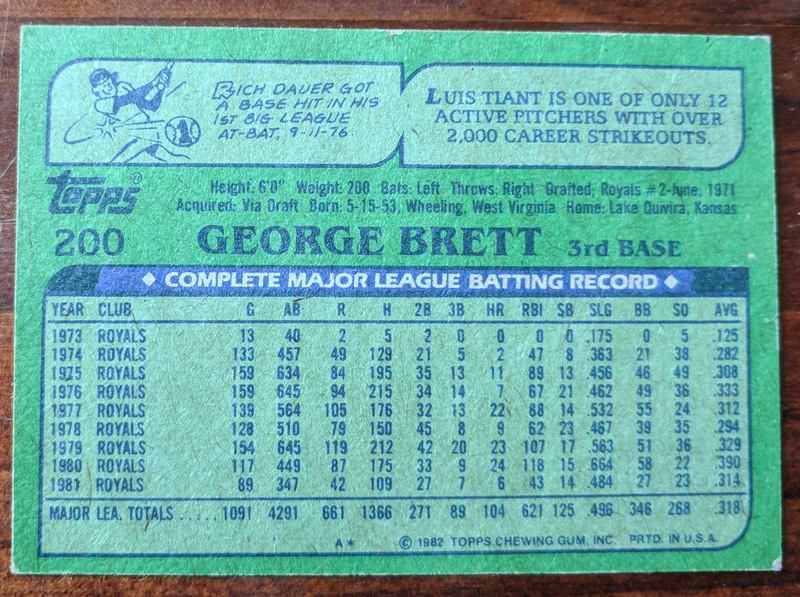 The first was 1973 Topps (my first real vintage card as a kid was a '73 Pete Rose I traded a Super Mario Bros. 3 NES cartridge for), more recently was 1980 Topps (the earliest cards I owned as a tyke were a few random '80 Topps A's my friend scribbled his name on the backs of). 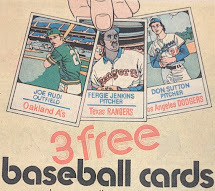 And now 1982 Topps gets wrapped up. It's the earliest set I ever bought a bunch of packs from. (Sorry to my grammatically-sensitive readers for ending so many sentences with prepositions.) I amassed probably around 60-70% of the set in my younger days, but that project went out the window when I left the hobby, to be boxed up and stored in the garage for 15 years before eventually jettisoning the gist of them when I moved out of state. I don't think this card was from my childhood collection (though I recall having his All-Star and In Action cards from the set). Honestly, I can't remember the source, despite searching my blog's archives for an answer. Probably either a trade from a few years ago or perhaps a cheap card show pickup. 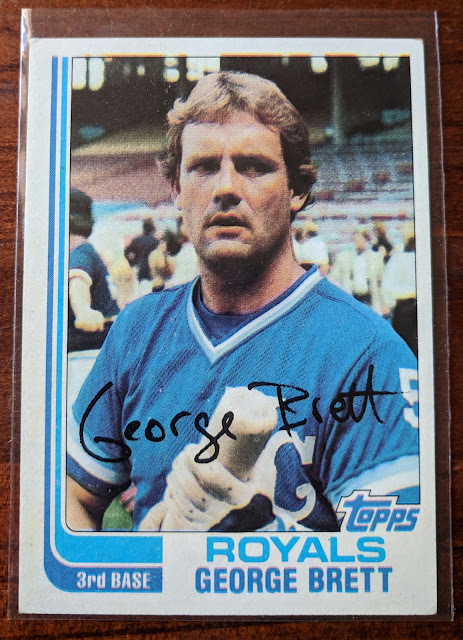 My blog has probably featured enough 1982 Topps over the past few months, so I don't think I'll pick out my favorites to feature today, but maybe I'll revisit the set in a future post, pointing out all the interview photos, the classic Fisk In Action card, and other things I might find interesting. But I'll at least show off the back of the Brett. I like the 1982 backs for sentimental reasons, but otherwise they're not great. The green overload is too dark and often hard to read. I like that there are cartoons, but they're pretty small, and I much prefer the "Did you know?" 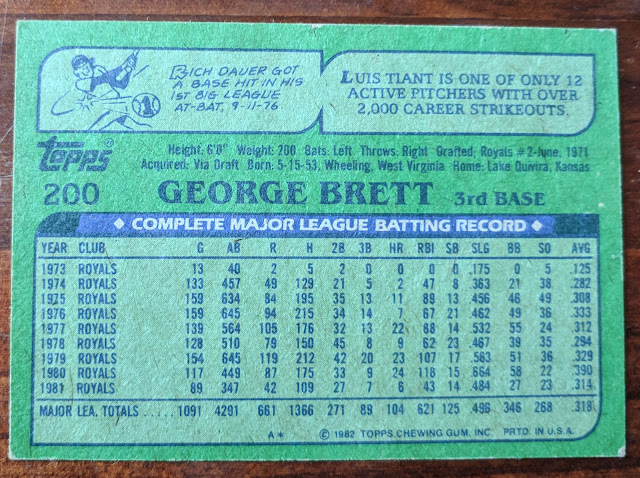 trivia to be regarding the guy on the card, not random baseball tidbits. So here we go, just about ready to be put to bed. I've still got about a dozen cards with wax on the fronts that I need to take a blowdryer to and wipe off (I already cleaned off a few the other day, but you can only do so much until your fingers start to burn!). And I still have 4 cards I want to upgrade before I can truly feel like I'm 100% done with the set. I'm not worrying about the little sticker inserts, errors, or the "blackless" printing variations. I would like to add the 1982 Topps Traded set as a complement someday, but no rush on that. Big thanks to everyone who's helped me piece together this set over the past few months, with special shoutouts to Turrdog, Larry P., Mark Hoyle, TSHenson, and of course Fuji for pushing me to the finish line. Glad that I could help you out. Looking forward to doing more trading with you in the near future. Congrats Gavin. Glad to help. What’s next? Thanks, Mark. 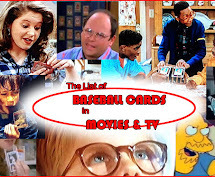 Just 4 cards left for 1987 Fleer Update, a dozen left for 1985 Donruss, then after that, '84 Donruss and '78 Topps are probably closest to completion. Congratulations on completing this set! I'm a big fan of this particular design. 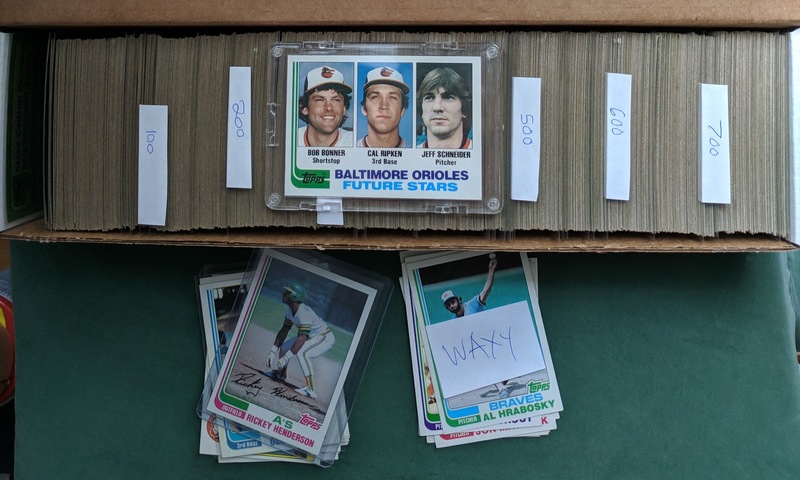 Anyways... this is going to sound random and crazy... but I've actually been trying to find a wax or gum stained Tony Gwynn rookie card. Figured even if they're damaged and less desirable... they're technically more rare than non-wax/gum stained cards since most cards came out of those packs clean. Told you it sounds crazy. I love having the ability to take a hair dryer to a card to remove the wax. Congrats on the 1982 set completion. I think the 80's designs are too often forgotten, but the 1982 is one of my favorites.